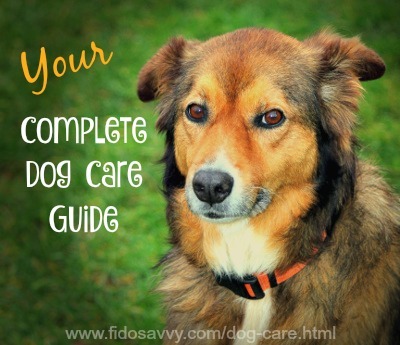 The right dog care information can make keeping Fido happy, healthy and well-mannered a whole lot easier. Dog care is about 70% common sense and 30% knowledge/experience. If you want to take good care of Fido and help him to live a long, happy and healthy life, you're going to need both of these. I can't provide the common sense (I'm just going to trust that you've got that nailed down already), but I CAN help you with that extra 30%. Plus, you'll find links to articles/pages which cover just about everything you'll ever want to know about caring for your dog. If you're looking for info. & advice on raising and caring for a puppy, visit my Puppy Care 101 page! Canine good health is always a priority, and it's one of our most important responsibilities as dog parents. The right dog care information and guidelines will take a lot of guess-work out of keeping Fido fit and strong. Good preventative veterinary care, including regular check-ups, vaccinations and de-worming, can prevent a lot of heartache and expense. When Fido was a puppy he should have been given several rounds of puppy shots which protect him against the most common, and most serious, dog illnesses & diseases. These include the 'biggies' such as Canine Parvovirus, Distemper, Coronavirus and Kennel Cough. BUT... puppy shots won't protect him for life and Fido still needs his booster vaccinations, often annually. Some of the vaccines your veterinarian uses may be effective for three years, so these shots don't need to be re-administered annually. Ask your vet about this when your dog has his yearly exam. Preventing parasitic infection is also hugely important part of dog health care. Both external parasites ( such as fleas/ticks and skin mites) and internal parasites (such as canine worms or single-cell organisms such as Giardia or Coccidia protozoa) can cause severe problems if left untreated. These can include allergic reactions, stomach upset, anemia, dehydration, even organ damage and, in severe cases, death. Mosquitoes can cause heartworms in dogs, and this is a serious, often fatal condition. Luckily heartworm prevention is simple, and effective. Every breed of dog is predisposed to certain types of illnesses, injuries or chronic conditions. Mixed breed dogs are often healthier overall than purebreds, but they're still at risk for the diseases which affect the dogs in their family tree. You can help keep Fido healthy by finding out which breeds he is descended from. A simple at-home dog DNA test will give you the answers you need. Large and giant breeds may have joint/bone issues or heart problems. Small breeds can suffer from hypoglycemia and luxating patellas (knee problems). Individual breeds can have issues that affect their eyes, ears, teeth, major organs, spine, brain and so on. Canine allergies affect many, many dogs and some breeds are more at risk than others. A well-balanced nutritious diet and proper veterinary care can help to minimize canine health problems, and getting treatment started at the first sign of trouble is important. That's why your dog care responsibilities include regular vet check-ups for Fido and a setting up a vet visit if you're concerned or worried about anything. Keeping Fidos' teeth clean and white, and his breath fresh, isn't just about his good looks and sweet smell.. it's important to his overall health too. 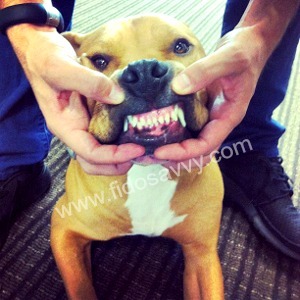 Good dog dental care includes brushing your dogs' teeth properly, and regularly. Feeding a good nutritious diet, choosing appropriate toys and supervising play are also part of your dog dental care responsibilities. If you notice one or more of these, or you see any swelling/bleeding of his gums, broken/decayed/loose teeth, have your veterinarian check out his mouth asap. No matter how careful we are in caring for our dogs, accidents can (and do) happen. Running on uneven ground can cause a bone break or ligament tear, as can a too-high leap/jump. Some weather conditions can pose a health risk to your dog and knowing how to protect Fido from heat stroke or hypothermia is important. It could save his life. Although dog pregnancy and whelping isn't usually considered an accident or emergency (well, the pregnancy might be accidental of course, if you haven't spayed or neutered your dogs), problems can arise and progress quickly. 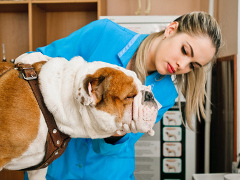 Whether it's getting into a dog fights being in a car accident or being hit by a moving vehicle or, for tiny breeds, even being stepped on or caught in the door, these can all cause injuries which need treatment. Having the right dog first aid supplies handy can make a scary situation less traumatic. 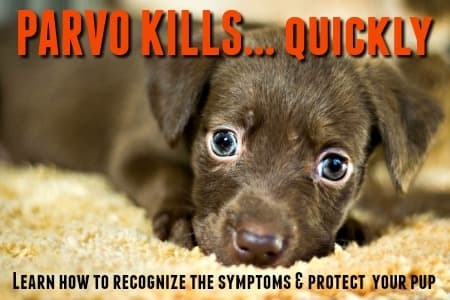 Many human medications, including pain killers, are NOT suitable for dogs, and I strongly recommend talking to your veterinarian before giving Fido any type of medication (even OTC products). For information on both prescription and over-the-counter pain medications for dogs, check out this page... Pain Medication For Dogs. If your dog is seriously hurt, you suspect internal injuries, or he's showing ANY signs of illness/disease or real distress, get him to a veterinarian right away. Do not try to treat, or medicate, him yourself. What you feed your dog doesn't just affect his weight. It has an impact on his overall health, activity level, even how long he lives. So, an important part of our dog care duties is choosing a diet that is appropriate for our individual dog. Choose only a premium quality dog food because generic, low-grade foods don't deliver the nutrition Fido needs. A poor diet can even cause health problems, including the increasingly common issue of dog food allergies. Contrary to that old wives' tale it IS very possible to 'teach an old dog new tricks'... and training is a very important part of dog care. Being able to understand your dogs' body language can make training (and much more) a whole lot easier. It simply takes more time, repetition and patience to train an adult dog than it does to train a puppy. We humans learn more quickly when we're children, but even as adults we are learning and refining our knowledge and abilities every day. So are dogs. Dogs need routine and predictability in their lives to feel secure and confident, and when you're training an adult dog, you need to be very consistent in every way. You'll need oodles of patience too. However, there are some positives about working with a mature dog rather than a puppy. For example, an adult dog has a much longer attention span than a puppy does, that makes training sessions more effective. If you're housebreaking a mature dog, you'll find he has excellent bladder/bowel control, whereas a puppy has very limited control in this area. This makes potty training quicker and easier. Using a crate is the best option, and most adult dogs accept being crated without too much fuss. However, if your dog gets hysterical at being put into his crate and/or left alone, he may be suffering from a behavioral condition called Dog Separation Anxiety. This can be managed, and usually reduced to a tolerable level (for all concerned), but again it takes time, patience and love. When it comes to obedience training, whether Fido is a pup or an adult, the basics﻿ are the same. You need to use positive, rewards-based training methods (no harsh punishments or blame) and start with the basic dog training commands. Don't rush things, stay calm and upbeat, and you'll find Fido learns quickly. No source of dog care information is even close to complete without looking at the most common behavioral issues. Dog behavior problems that are not obedience-based (ie your dog won't 'come' when you call him) are often caused by anxiety. 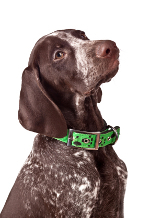 The most common ones are Dog Separation Anxiety, Submissive Urination and Dog Noise Anxiety. All of these can be managed, even eliminated with the right approach. 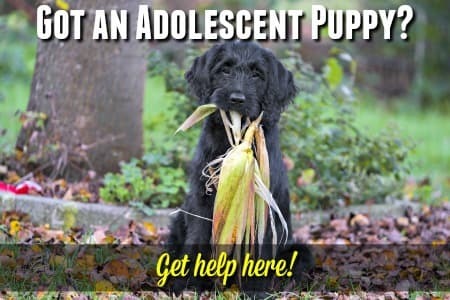 This also applies to other dog behavior problems such as excessive barking or adolescent/teen puppy behavior issues. Fear based aggression is one of the most unpredictable types of aggression in dogs and can almost always be avoided if a puppy is properly cared for and socialized. Very rarely there is a genetic component, but overwhelmingly this type of behavior in dogs (whether towards people or other dogs/pets) is down to poor upbringing or circumstances. Socialization is an important part of puppy training, but it's also something which should be continued throughout the lifetime of your dog. Socializing a dog basically just means giving them the exposure to different people, places and animals, so that they learn to be comfortable in any surroundings or situation. The process is the same whether you're working with a puppy or an adult dog, but you always need to take Fidos' personality and comfort zone into account. Don't rush things and don't force him into situations which scare or stress him too much. Slow and steady wins the race. Check out this page to learn more about socialization in general... Puppy Socialization. There are SO MANY dog products available that it can be a bit overwhelming at times. Of course there are essentials that every dog needs.... things like dog food, a collar and leash, potty-training products, grooming tools and so on. Then there are the 'extra' things, the luxuries, and it's these that can boggle the mind - and put a strain on your wallet. Over the years (umm, decades!) I've bought a LOT of dog stuff. Some of the products turned out to be great buys and I've continued to use (and replace) them over and over again. Others didn't survive the 'testers' in my home, or proved to be poor quality or just unnecessary... and I just hate wasting my money on those. To help you avoid making some of the same mistakes, I've put together several pages on my site which feature supplies that I've used and trust, as well as many popular items and new-to-the-market products. A good reference book is always a wise investment, and these are three of the very best dog care information books on the market. I own each one and in fact, I've used the Original Dog Bible so much that the cover fell off years ago! Worth it's weight in gold.